Hybrid repair constitutes supra-aortic debranching before thoracic endovascular aortic repair (TEVAR). It offers improved short-term outcome compared with open surgery; however, longer-term studies are required to assess patient outcomes and patency of the extra-anatomic bypass grafts. 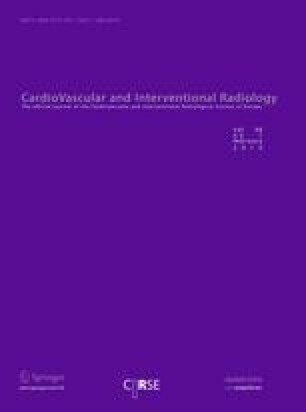 A prospectively maintained database of 380 elective and urgent patients who had undergone TEVAR (1997–2011) was analyzed retrospectively. Fifty-one patients (34 males; 17 females) underwent hybrid repair. Median age was 71 (range, 18–90) years with mean follow-up of 15 (range, 0–61) months. Perioperative complications included death: 10 % (5/51), stroke: 12 % (6/51), paraplegia: 6 % (3/51), endoleak: 16 % (8/51), rupture: 4 % (2/51), upper-limb ischemia: 2 % (1/51), bypass graft occlusion: 4 % (2/51), and cardiopulmonary complications in 14 % (7/51). Three patients (6 %) required emergency intervention for retrograde dissection: (2 aortic root repairs; 2 innominate stents). Early reintervention was performed for type 1 endoleak in two patients (2 proximal cuff extensions). One patient underwent innominate stenting and revision of their bypass for symptomatic restenosis. At 48 months, survival was 73 %. Endoleak was detected in three (6 %) patients (type 1 = 2; type 2 = 1) requiring debranching with proximal stent graft (n = 2) and proximal extension cuff (n = 1). One patient had a fatal rupture of a mycotic aneurysm and two arch aneurysms expanded. No bypass graft occluded after the perioperative period. Hybrid operations to treat aortic arch disease can be performed with results comparable to open surgery. The longer-term outcomes demonstrate low rates of reintervention and high rates of graft patency. The authors especially thank Mr. Oliver Lyons for his help with statistical analysis.